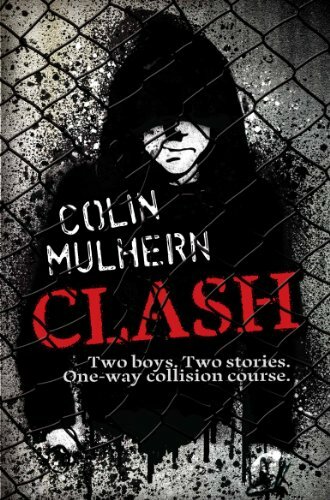 Clash follows the story of two very teenager different boys, Alex the cage fighter and Kyle the artist both both attend the same school. Each chapter alternates between each boy's story which interweave with each other as their story progresses. I wasn't too sure what I'd make of this book. The main character takes part in illegal cage fighting and I thought it might not be all that intelligent and just violent for the sake of it but it certainly wasn't. The best thing about it was getting underneath the skin of Alex. He is a cage fighter and he has earned the reputation of being psychotic at school as he will happily beat people up you are a lot bigger than him in a really nasty way. People are scared of him and keep out of his way. I found it really interesting to find out why he is the way he is and loved getting into this background and seeing home his home life had pushed him to become the way he was. I actually ended the book feeling really sorry for him. The other half of the story follows the story of kyle. Another teenage both. He, like everyone else in school, is wary of Alex. He is an artist who lives with his single mother. His story was sweet and even quite heart breaking at times but wasn't as intriguing as Alex's although that said it was interesting to see the two of them together and how Kyle influences and changed Alex's behaviour. The book itself flowed well and was an easy read. The storyline kept me happily engaged in what was going on and I for one enjoyed it. All in all a gritty boy friendly book from a debut author who I will be interested to read more from in the future.